Today I worked on the top fabric layer of the dress. Cut out all the pieces, except the back which I managed to salvage from the first go around. Then pinned and sewed the pieces together. At this point I have all three main layers ready to construct the dress I just need to stick 'em together. *Sweat drop* Everything should be fine, but I can't help feeling apprehensive. This update doesn't reeeeally have a costume to be attached to, however, I did technically do it with Ciel Phantomhive in mind. I bought these shoes from Value Village a couple years ago, specifically for the heel. 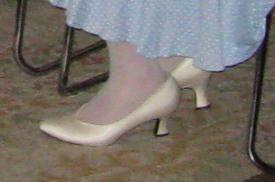 I had originally planned to cover these shoes and use them for an 18th Century costume. However, this past weekend I had been throwing around the idea of dyeing these shoes and using them with the Ciel costume. I would much prefer to use actual lace-up boots like in the art book design, but I'm coming up against two problems. One: I can't find any lace-up boots that would work. Two: the ones I'm finding are way out of my price range. So, I used a possibly non-typical way to dye these shoes. I used Dylon Ebony Black dye and according to the label the shoes are Thai Silk. Dissolved quite a lot of it in two cups of hot water and painted the stuff on the shoes with a sponge brush. The shoes were not really as absorbent as I expected them to be... so towards the end I started sprinkling the dye directly onto the shoes and using the wet sponge brush to dissolve and spread it out on the shoes. This significantly increased the saturation of the dye. There are a few spots along the bottom of the shoes that wouldn't really cover, but I figure I can go over the spots with a black sharpie (they're very small spots and so the not-quite-blackness of the sharpie would probably not be noticeable). When these are all dry and done I will attempt to make some spats to go with them. I'm pretty excited about this part, hopefully time will allow for this additional little project. Finished the lining, but still need to attach it to the bodice foundation layer. Yesterday, went to Rona and Michaels to raid them for possible parts to make up the screw. Bryan is rather insistant that this screw should turn and click, like it does in the show. I'm not really going to get involved with this... Anyway. During the week Bryan managed to finish all the stitches on the front of the t-shirt, excepting the neck, which I will need to figure out how do in a little while... i.e. the night before it's needed. Today I have finished the lab coat. Pretty soon I or Bryan will have to start on the stitches on that one. Perhaps I'll be able to do some later. So, on Thursday and Friday I made the dress in the top layer fabric. But I didn't like it. The main problem was that the skirt was extending out of the bodice section below the waistline, creating a very long torso effect that wouldn't fit properly over the hoop/was pushing the hoop down too far. So I started over today. I decided to make it out of my more expendable lining fabric first, in case I wasn't please again. It looks better now, although there are still some things I don't like, the problems now have more to do with my hoop being annoying than anything else. There isn't really much I can do about that, however, without risking the underskirt and dress no longer fitting over it properly. Today we also purchased wigs for Ciel and Dr. Stein, which is both very exciting and scary, naturally. And I picked up my longer zipper and some dye to dye my shoes. If I can fit it in, I'm going to dye my shoes black and makes some spats for them, because I can neither find nor afford the lace-up boots I would need. At least not in time for the Ball. Maybe for Anime North, heh. For better or worse I cut out the pieces in the pink top fabric. I was going to also sew some of these pieces together but I cannot for the life of me find a free bobbin. *Dies* On the bright side, I appear to have more than enough fabric. More than enough. I will need to get one, Friday evening probably. Which probably means I'm not really going to be able to do much work on Friday during the day. I will leave off this entry, however, with one final thought: Oh my God Pink! So, on Friday evening I went and bought the fabric for the dress. I got a matte bridal satin in a colour that can really only be described as Pink!, but I suppose that is appropriate. I also picked up some interfacing, twill tape, the pink ribbon and a cute little white lace trim. And a zipper. I also did some more work on the bodice mock-up (noticing in particular one very big mistake, that I'm too ashamed to write here, learning experience be damned). On Saturday I realized I had forgotten to get some lining. So we headed back over to Fabricland and I picked up some broadcloth also quite Pink!. But appropriate. When I got home I started work on the interfacing layer. I decided this was going to be the foundation on which I built the entire dress, hopefully this will work out as well as I think it will. I cut out all the pieces, attached them together and began making boning channels with the twill tape. I ran out of twill tape less than halfway through this process (I had no idea how much to buy, in my own defence) and had to go back to fabricland to get more. Thank god for that 50% off members sale, I tell you what! I've only had my renewed membership for about two weeks and I think I've earned back its cost already. Between Saturday evening and Sunday morning/afternoon I managed to finish all the boning channels and insert the boning. There are seven bones on the front and seven on the back. I pinned the interfacing to the zipper to test out the fit, and I am very satisfied, except for some minor gaping the back, which is easily remedied. The zipper, however, is a tad too short. *Kicks self* Which means... yet another trip to Fabricland. I also managed to pick the pink flowers and white ribbon for the hat on Saturday morning. Anyway! Except for one little "engineering" issue I have with the back of the dress I should be ready to start work on the top layer of the dress at any time. Exciting and scary, to say the least. On Saturday I also tailored Bryan's lab coat. It looks much better now, except for a little twisting of the sleeve when his arms are down. Which is annoying. 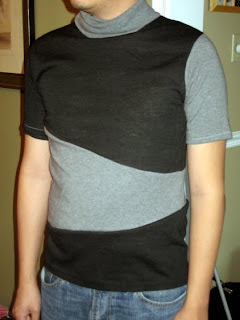 And he did a lot of work making more stitches on his shirt; it's looking so good! Been feeling a little under the weather, so progress this week has been minimal. I made an epic to-do list for this costume, it's three printed pages long. So... daunting. I've decided also to wait to make the other two small rows of underskirt ruffles until the dress is done, so I can have a better idea of placement. 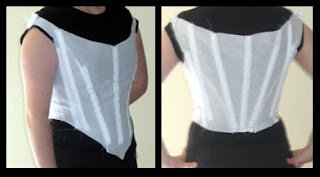 This morning I made a mock-up of the bodice (it's going fairly well, but will require a few adjustments) and a mock-up for the front dress panel, to get an idea of how it should be put together.... Tonight I plan on going to buy the fabric for the dress. Looks like I'll probably need 10 meters, so this costume is adding up in price and yardage, to say the least. Yesterday I recieved my Dalhousie application. I filled that out and started work on my accompanying letter. Apparently they start making considerations in mid-November. I'm thinking I'd like to get a few photoshoots in soon, if possible, so my portfolio has some better pictures of my more recent costumes. And probably I will wait until I'm finished with the ball gown too, so I can include that. This post encompasses work done today as well as yesterday. Basically what it amounts to is the completion of the second ruffle. I had a little bit of a snag with this one, as I ran out of fabric before I got all the way around to where I needed the ruffle to end. I had to add an extra two meters to the ruffle and still it wasn't quite enough to get the fullness I'd have liked right at the end on the left hand side, but it's something that isn't noticeable. This, however, leads me to believe that I greatly underestimated the length of fabric for the first ruffle. I thought it had been six meters long (which I why I thought five meters would be sufficient for the second ruffle), but after some thought it was more likely to have been ten meters. And eight, rather than the seven I ended up with, would have been the perfect amount of fabric for the second ruffle. Overall, the process was much the same. In some respects I've inherited this costume as well. Bryan took apart all the pieces of the shirts and attached most of them. I had to serge all the pieces, to allow for stretching. With the shirt surgery completed, I started working on the "stitches". We decided the best method would be to use embroidery thread, rather than some of the other methods I've seen. I used a crisscross backstitch to make the lines, and I think the effect is very appropriate. I've done about 30 on the shirt so far. Bryan also started disassembling the lab coat, and I did some necessary stain removal. Fun times. I sense there will be a lot of parts to this. Today I finished sewing down the first ruffle in addition to the black ribbon detail. So first ruffle = 100% done. Yay! The fun part about that, however, is that it is going to be about 75% covered by the second ruffle. Not so much yay. I also measured out the second ruffle, cut and prepared it for gathering. Just for reference I cut the first ruffle to 16 inches and the second to 13 inches (each cut on the selvage, with an additional one inch for the seam allowance). The unfortunate thing about this costume is that even though I have done so much work, it barely looks like I've done anything. It'll take quite a lot more hours for it to start like I've completed a significant chuck. But, c'est la vie! We also took a trip to Value Village and Fabricland today. 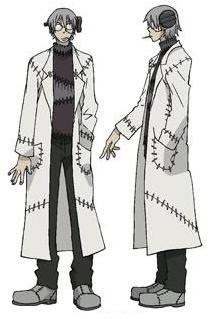 Bryan is starting a Dr. Stein (from Soul Eater) costume, which we picked up supplies for - shirts to operate on (heh), chunky boots and a lab coat, which was a pretty miraculous find! 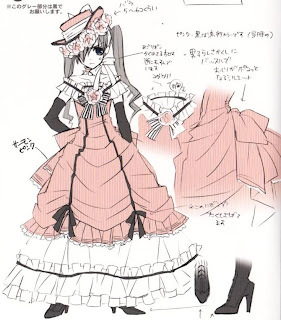 I got a cheapish top hat to be the base for Ciel's hat. And I also got a white vest (and yellow dye) for my future Maka Albarn (also from Soul Eater) costume... very future. Bottom ruffle is fully attached, and black ribbon is pinned in place. Had issues with sewing the ruffle on by machine. 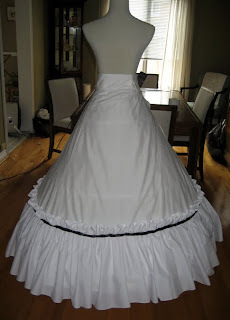 The ruffle slipped down in a lot place (despite pins) and it was very wonky looking when put back on the hoopskirt. I will have to account for this possibilty in the future somehow. Either making a pencil line or basting it in place first. Probably both options, actually. My last day of summer vacation. Alas. Went to Fabricland first thing to pick up a new spool of white thread, and also some black because I'm pretty sure I'd run out of that too before this madness is over. I also got some more white fabric, just in case. I finished the second row of thread for gathering the bottom layer of ruffles, gathered everything and pinned it onto the underskirt. It took all six meters to fill the bottom of the skirt, and even so it could have benefitted from about a foot, or so, more. I also made a few finishing stitches on the waistband, which apparently I'd missed earlier. 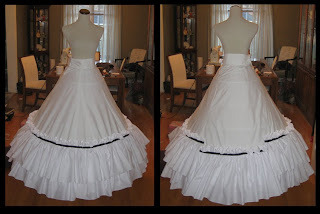 Ciel Phantomhive (Little Robin): Started work on the bottom ruffle of the underskirt. At the moment it is 6 meters long, and I really hope that's enough. Unfortunately I ran out of white thread before I could finish making the gathers. I may decide to err on the side of too much fabric and pick up some more white when I get the new thread. I sense this one is going to be a lot of work. Sailor Jupiter and Sailor Mars are officially finished! Whoo. Success!